Onaero Bay is just a short 25 minutes north of New Plymouth on State Highway 3. Close enough to have a relaxing weekend away and feel like you've come back totally relaxed and renewed. 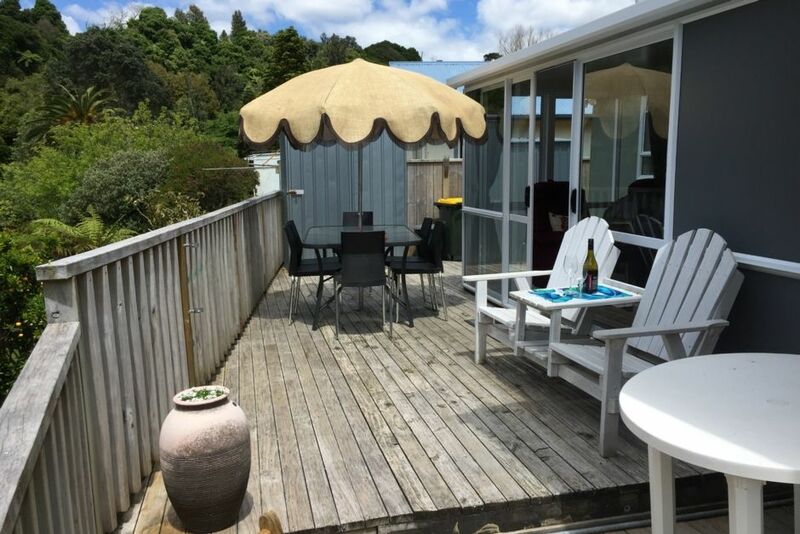 Our kiwi bach is on the Onaero Domain and borders the estuary of the Onaero River which is not only safe for swimming but has its own private boat jetty to launch the kayaks as well as a whitebait net (in season). We have two kayaks which you are welcome to use (please use the lifejackets supplied). The bach is comfortable and roomy enough for a family or just a couple wanting time out. The area is very sheltered but for the cooler days there is a wood fire. There is a master bedroom plus two comfy couches in the lounge room which can accommodate another two people. The interconnect garage room has a double bed, a single bed, and a sofa bed. There is also a rollaway bed. Also let us know if you require a portacot and highchair. The fee is for the first four people and any other adults are $30/night and children $15/night. Almost everything is supplied, including basic pantry items. Just bring your clothing, toiletry items, food and enjoy! The Onaero Beach is a very safe beach and close by; perfect for swimming, surfing and fishing. There is a boat ramp five minutes drive away and also close by you will find Mike's Ales and shopping available at Urenui Superette along with a tavern and fuel requirements. Urenui also has a 9-hole golf course. New Plymouth boasts many fine attractions including beautiful Pukekura Park, the Bowl of Brooklands where many famous artists have entertained, the Coastal Walkway and Wind Wand, along with Govett Brewster Art Gallery and Pukeariki Museum. Mt Taranaki/Egmont is also not far away for those wanting to explore the bush walks. Due to other baches close by, no excess noise or parties will be tolerated. All linen including sheets, towels, pillowcases, tea towels, duvets etc is available but must be washed before departure. You may wish to bring your own sheets and towels and complete your laundry once back home. The bach must be left clean and tidy ready for the next guests to enjoy ie. vacuumed and the shower, toilet andamp; kitchen cleaned. Extras: Linen (Required, NZ$10.00 per stay); NOTE: Under Kiwi bach tradition you are expected to: Clean the house and do the dishes leaving the Bach as you found it. Nearly retired but love to work! This kiwi bach appealed to us from the moment we first stepped through the front door. The tranquil bush view beyond the river from the rear deck is spectacular. The Bach comfy and relaxing. Summer scene family fun days and our own private boat jetty and whitebait stand. Please launder before departure or alternatively you may wish to bring your own. Freeview channels, DVD player including movies for kids & adults. Stereo. Great place to stay, clean and tidy! Has everything you need plus extras like games and kayaks. Would definitely stay again ?? One of Taranaki's best kept secrets. we loved it and will definitely be back to stay again.